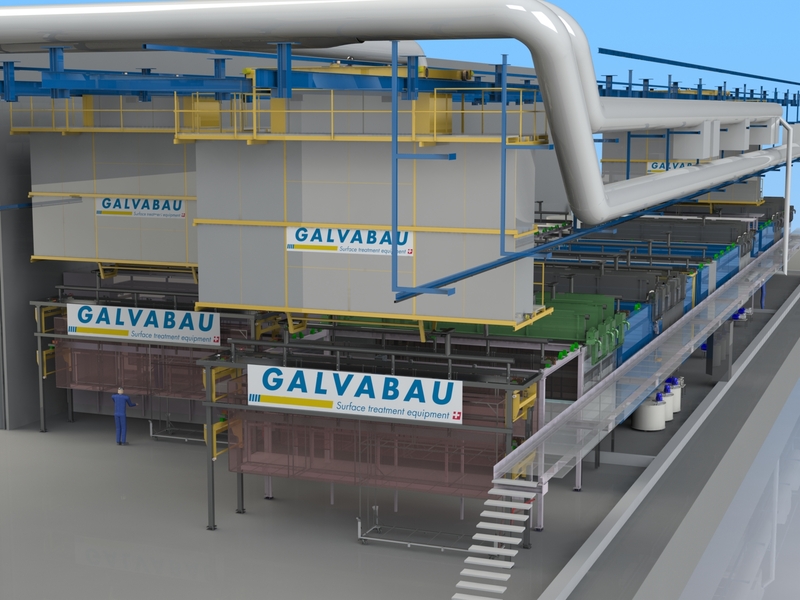 GALVABAU has got the order by RUAG Aerostructures to build a new galvanic plant. In their nature and construction the TSA anodizing and crack testing facility will be the largest galvanic-line in Switzerland and one of the largest anodising and crack-test systems in Europe. The size of the plant is also impressive for experts in the galvanic sector. In future, wing parts for the aircraft industry will be anodized and crack-tested in this line. The plant is designed with 2 rows and will be 60 m long. The width is approximately 21 m with a height of approx. 11 m.
The usable working window is 7000 x 1000 x 2300 mm (LxWxH). The bath volume of a single rinsing tank is about 28000 liters. Until the plant is able to start their production in Emmen, around 400 tonns of material are processed and installed at GALVABAU in Hergiswil. For GALVABAU, this order is the largest single order in the company’s history. The GALVABAU employees are proud to build and install a galvanic line in these dimensions. Almost on the doorstep, and is also proud of the fact that a committed Swiss SME can hold its own in international competition, despite the difficult economic conditions.